Research about the potential benefits and possible problems of air duct cleaning is limited. Since conditions in every home are different, it’s impossible to generalize about whether or not air duct cleaning in a house would be beneficial. If no one in the household suffers from allergies or unexplained symptoms or illnesses, and a visual inspection of the inside of the ducts yields no indications that the air ducts are contaminated with large deposits of dust or mold (e.g., there is no musty odor or visible mold growth), having the air ducts cleaned is probably unnecessary. It is normal for the return registers to get dusty as dust-laden air is pulled through the grate. This does not mean that the air ducts are contaminated with heavy deposits of dust or debris; the registers can be easily vacuumed or removed and cleaned. On the other hand, if family members are experiencing unusual or unexplained symptoms or illnesses that the homeowner thinks might be related to the home’s environment, they should discuss the situation with their doctor. The EPA has some publications for guidance on identifying possible indoor air quality problems and ways to eliminate and prevent them. A homeowner may consider having their air ducts cleaned simply because it seems logical that air ducts will get dirty over time and should occasionally be cleaned. While the debate about the value of periodic duct cleaning continues, no evidence suggests that such cleaning would be detrimental, provided it is done properly. However, if the service provider fails to follow proper duct cleaning procedures, the cleaning can actually create indoor air problems. For example, an inadequate vacuum system can release more dust, dirt and other contaminants into the system than if the ducts had been left alone. A careless or inadequately trained service provider can damage the ducts or heating and cooling system, possibly increasing the heating and air conditioning costs, or forcing the homeowner to undertake difficult and costly repairs or replacements. Many sections of the heating and cooling system may not be readily accessible for a visible inspection, so ask the homeowner or service provider to show you any mold they may say exists. The homeowner should be aware that although a substance may look like mold, a positive determination of whether it actually is mold can be made by a certified mold inspector and will require laboratory analysis for final confirmation. For a small fee, some microbiology laboratories (such as PRO-LAB®) can tell you whether a sample is mold or simply a substance that resembles mold. If the house has insulated air ducts and the insulation gets wet or moldy, it cannot be effectively cleaned and should be removed and replaced. If the conditions that caused the mold growth in the first place are not corrected, mold growth will recur. Ducts are infested with vermin, such as rodents or insects. Ducts are filled with excessive amounts of dust and debris and/or particles are actually released into the home from the supply registers. Duct cleaning has never been shown to actually prevent health problems. Neither do studies conclusively demonstrate that particle (or dust) levels in homes increase because of dirty air ducts or decrease after cleaning. 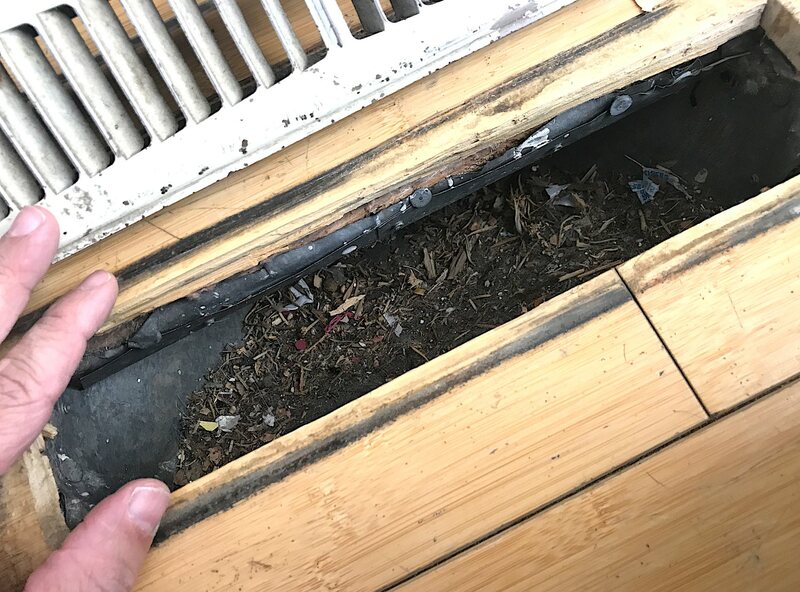 This is because much of the dirt that may accumulate inside air ducts adheres to the duct surfaces and does not necessarily enter the living space. It is important to keep in mind that dirty air ducts are only one of many possible sources of particles present in homes. Pollutants that enter the home both from outdoors and indoor activities, such as cooking, cleaning, smoking, or just moving around, can cause greater exposure to contaminants than dirty air ducts. Moreover, there is no evidence that a light amount of household dust or other particulate matter in air ducts poses any health risks. The EPA does not recommend that air ducts be cleaned except on an as-needed basis because of the continuing uncertainty about the benefits of duct cleaning under most circumstances. The EPA does, however, recommend that if a house has a fuel-burning furnace, stove, or fireplace, they be inspected for proper functioning and serviced before each heating season to protect against carbon monoxide poisoning. Some research also suggests that cleaning dirty cooling coils, fans and heat exchangers can improve the efficiency of heating and cooling systems. However, little evidence exists to indicate that simply cleaning the duct system will increase the HVAC system’s efficiency. If a homeowner thinks duct cleaning might be a good idea for their home, but they are not sure, a home inspector should refer them to an indoor air quality professional. The company that services their heating and cooling system may be a good source of advice. The home inspector may also recommend that the homeowner contact a professional duct cleaning service provider and ask them about their services. The homeowner should remember that any service providers will try to sell them a service (or several), so they should ask questions and insist on complete and knowledgeable answers.